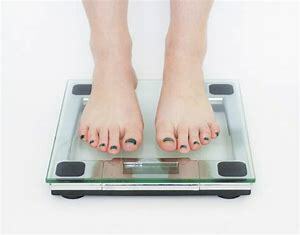 Some women resist taking HRT for fear of gaining weight and others often complain that HRT is the cause of their weight gain. However, there is evidence to suggest that this is not true. Indeed, some HRT regimens may actually help prevent the increase in body fat mass and fat redistribution that occur during the menopause. The menopause is a time associated with a decrease in the resting metabolic rate that reduces the utilisation of calories. If women continue to follow pre-menopause eating and exercise patterns, they will gain an average of a pound a year post-menopause. The only two things that can effectively boost metabolism are increased daily activity and exercise. Where fat is deposited in the body also changes during the menopause as a response to the fall in oestrogen levels. There is a shift of fat storage from the hips and bottom (pear shape) to the waist (apple shape). Consequently, even slight weight gain can result in a change of dress size. The drop in oestrogen also modifies insulin resistance, making it easier to gain weight, as the body stores rather than burns calories. For example, for every 1,000 calories eaten before the menopause, 700 will be burned and 300 stored. After the menopause, 700 calories will be stored and 300 calories will be burned. This increased insulin resistance and abdominal weight gain is also associated with several chronic diseases and metabolic conditions. It increases the risk of type 2 diabetes, hypertension and heart disease. It is important to be aware of the health problems linked to weight gain at the time of the menopause, especially when oestrogen levels drop. One could consider using the time of the menopause as a reason to review overall health and possibly adjust lifestyle to ensure a healthier life. This translates into being thoughtful about what one eats and, for many, being more active every day. Hormone replacement therapy can also help women lose unwanted abdominal fat that appears post-menopause. It should also help improve sleep and general well-being, resulting in more energy to tackle losing excess pounds through exercise. One is also less likely to comfort eat if one feels good. A very small group of women may develop fluid retention with HRT (up to 10 lbs in a month), but in most cases it is mild and will settle in four to six weeks. A 2009 study confirmed the benefits of hormone therapy and physical activity in reducing weight gain after menopause.